Trader Joe’s and I have a long history of unrequited love; a love for all things sweet. We don’t have a store close to my town (yet), so I return home from trips with a candy-filled suitcase. In the future I may need an entire category for their chocolates! Last month my kind sister-in-law brought us all sorts of gifts from TJ’s. 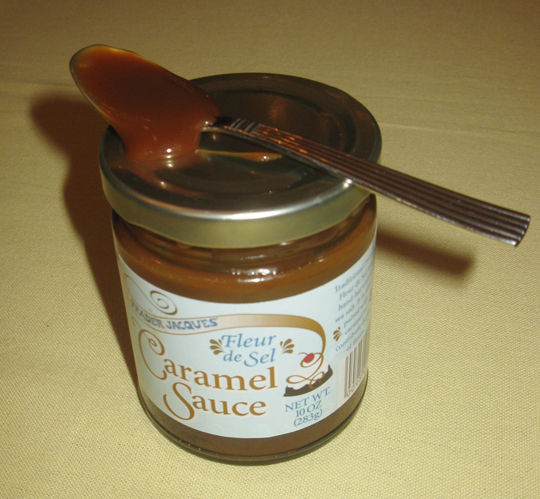 One of which was the Fleur de Sel Caramel Sauce. Note the French version “Trader Jaques” on the label. Try it, and you will only settle for this sauce, or homemade. You can taste the butter, sugar and the salt in perfect pairing. It is very thick in the jar, almost as think as a caramel candy. I suggest serving it warm, over vanilla ice cream. This is so rich that you don’t want to pour too much, so go easy. Only pair with superior ice cream, this is not the time for frozen yogurt, or *gasp* ice milk (do they still make that?). This is my advice, so lean in and listen….bring this as a hostess gift, wrapped up like you would a scented candle. You’ll be invited back again, and again. Posted in Caramel. Bookmark the permalink.